We’ve selected a set of five ID Aids from ITP’s vast collection that are helpful for identifying, diagnosing, and learning about pests and diseases that affect bees and bee colonies. 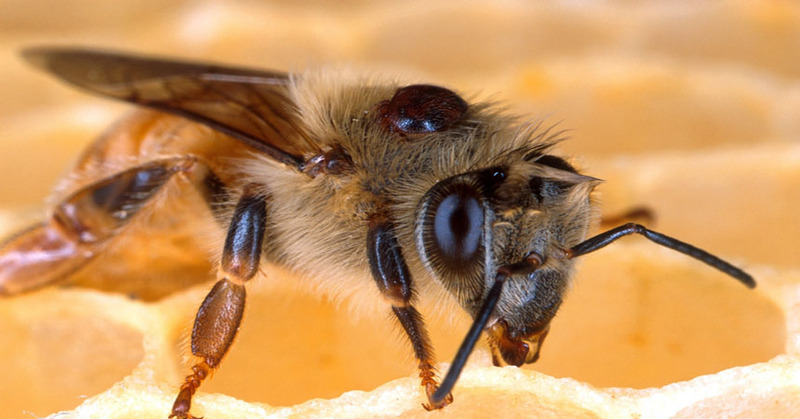 Bees are particularly important as pollinators of agricultural crops and have recently experienced decline resulting from a number of factors, including pesticides, diseases, and parasitic mites, insects, and vertebrates. The Intergovernmental Science-Policy Platform on Biodiversity and Ecosystem Services (IPBES) has evaluated the threat of pollinator extinction due to factors such as these in a timely two-year study, "Thematic Assessment of Pollinators, Pollination and Food Production”, released on February 26, 2016. Fact sheet containing information about the disease, its symptoms, and its causal agents. 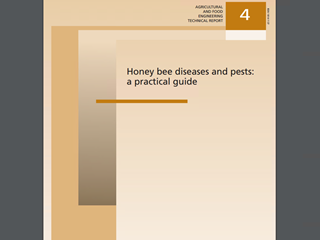 Guide containing images, descriptions, and symptoms of 15 bee diseases, parasitic bee mites, and pest insects and vertebrates. 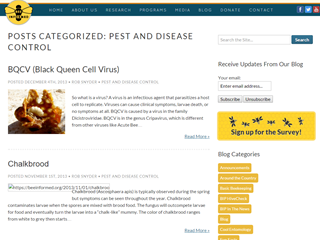 “Pest and Disease Control” blog category includes illustrated posts about various bee pests and pathogens. Find additional information under the “Media: Press/Publications” tab. 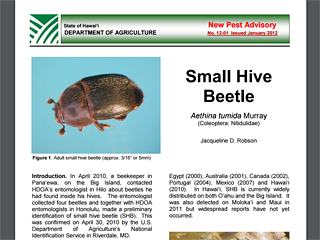 Fact sheet with description, distribution, damage information, and images of adult small hive beetles and larvae. 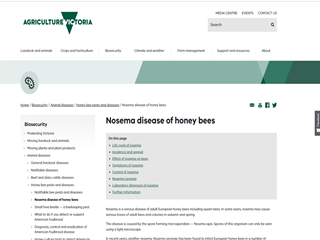 Select "Bee Pests, Diseases & Maps" on left menu for fact sheets, which are then listed on (changed) left menu, or “Image gallery” for images of bee pests and diseases. 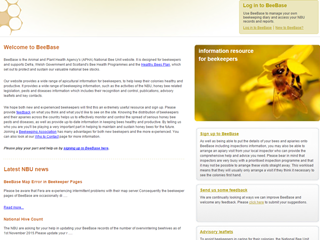 Select “Advisory Leaflets and Training Manuals,” on right of home page, for additional resources.